New Delhi : In its bid to check the “misuse” of funds under MNREGA, the Rural Development Ministry has removed as many as 87 lakh job cards from the beneficiaries list, Union Minister Ram Kripal Yadav said on Monday. “The Rural Development Ministry had started a cleansing drive to check whether funds under the Mahatma Gandhi National Rural Employment Guarantee Act (MNREGA) were reaching the genuine beneficiaries, and in that drive it was found that about 87 lakh job cards were duplicate or fake or the beneficiaries had died,” he said. About 63 per cent of 12.49 crore job cards issued under the MNREGA Act have so far been verified, the minister said. It was found that the cards were made in the name of the beneficiaries who did not exist, Yadav said, adding that the work was allocated and amount released to such dubious claimants. 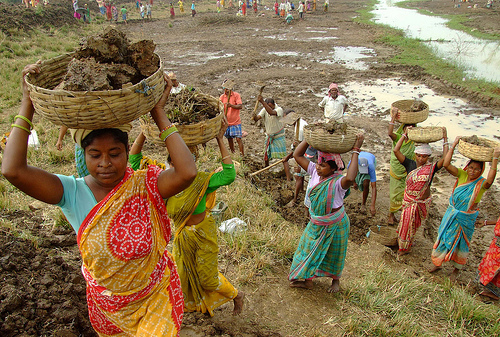 The flagship programme of NREGA is a demand-driven employment scheme. Not less than 100 days of employment is provided to registered workers upon receipt of their demand. These workers are given job cards which are linked with their Aadhaar numbers and bank accounts. NREGA provides supplementary means of livelihood to people in rural areas, primarily during lean periods. The Centre has also announced additional employment over and above 100 days per household to upto 150 days in notified drought-affected districts in various states of the country. Assets created under NREGA include works related to natural resource management such as water conservation, land development and irrigation. Besides these, dams, irrigation channels, check dams, ponds, wells and Aanganwadis are also built under the scheme.